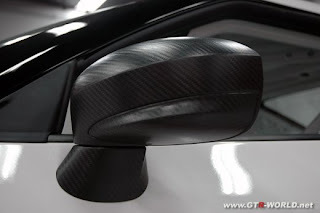 Pretty carbon fiber mirrors. Supposedly lots of carbon fiber going into the car. Trunk, hood , mirrors, seat. Lexan windows. I see a cooler under the rear bumper there. 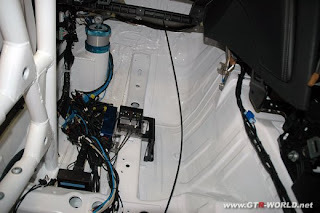 The roll cages they allow in Japanese racing would never pass tech inspection in a professional race series in the US. Bolted together elements. Multiple bends in the front down tube. Low door bars. No harness bar. This cage looks like a total abortion.